The eternity of God implies that He endures forever; he is outside the realm of time. His unchanging character (immutability) indicates that he remains the same always. God exists forever (eternity); He is the same forever (immutability). He was holy, powerful, and wise five thousand years ago. He remains the same today. And his promises are unchanging because he is unchanging. The Bible often teaches this truth by referring to God as a Rock, implying his immutability: Deut. 32:4, 15, 18; 1 Sam 2:2; 2 Sam 22:32. Other passages that refer to this attribute include: Rom. 1:23; Mal. 3:6; Isa 48:12; Heb 1:11,12; and James 1:17. 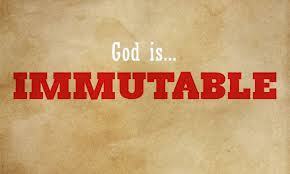 If God were not immutable (unchangeable) he would not be God. For He is the ultimate cause of all things. It is on him that the entire universe in all its aspects (physical, moral, social, religious) hangs. All of this rely on a God who is constant and not subject to change. According to Herman Bavinck, a nineteenth century Dutch theologian, the doctrine of immutability is of the highest significance for religion. The contrast between ‘being’ and ‘becoming’ marks the difference between the Creator and the creature. Every creature is continually becoming. It is changeable, constantly striving, seeks rest and satisfaction, and finds his rest in God, in him alone, for only he is pure being and no becoming. Once I was a child, then I grew up and I am still growing. At a point I was ignorant and foolish, but I increasingly became wise and knowledgeable. This is normal for us as human creatures, but it is unthinkable for God. God rests in himself and for that very reason he is the goal and the resting point of every creature, the Rock of Salvation, whose work is perfect. He who predicates of God any change whatsoever, whether with respect to essence, knowledge or will belittles every one of his attributes…He robs God of his divine nature and religion of its firm foundation and sure comfort. A God who changes isn’t much of a help. We trust in God, depend on Him and flee to Him because he is constant. We trust that he is not only ‘Our help in ages past’, but also ‘Our hope for years to come’. A mutable God, subject to change like his creatures, leaves us lost and helpless. God cannot change his purposes and promises. All that God intends to do he does. This is why we can rest in his salvation, for it is based on an eternal decision made long before we were even born. When God saves a person, he is carrying out a plan he made concerning him or her before the the world was even created. And no power or force can disrupt this plan, for the One who made it remains the same yesterday, today and forever (Heb. 13:8).